Once upon a time people believed that the Earth was flat and this was their truth, until somebody discovered otherwise. The world had changed, but in reality it was only people’s view of the world that had changed, since the Earth had been round from its beginning. Now the Earth is moving into a new time and a new spiritual dimension opens up within peoples’ hearts. A spiritual dimension that has been there all the time, but which people were formerly incapable of comprehending and thus reacting to. The pure spirit energy is right now about to invade the Earth completely. Not as a strong white light or a great holy Angel descending from above, but through all the children of The New Time who are born now and in the years to come. They are born with the pure spiritual energy fully integrated in their body. 1995 was the year where all children were born with a pure indigo aura. 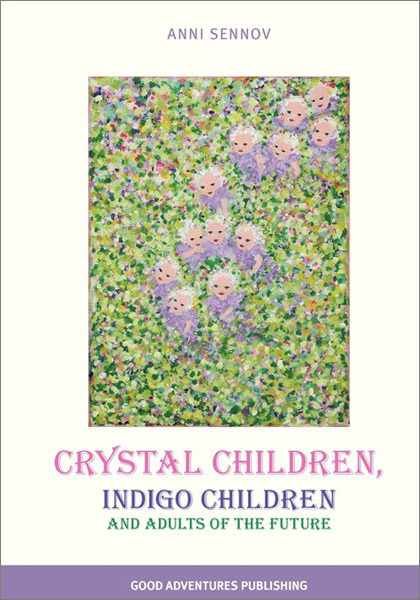 2012 is the year where pure Crystal Children will be born on this Earth but already from 2004 we will start seeing crystal energy being slowly integrated into the aura of the Indigo Children. Common to the children born from 1995 and onwards is that they all possess some characteristics and values very different from their parents and previous generations. Parents, grandparents, kindergartens, schools, well the whole of society stand at the threshold of great challenges concerning the fulfillment of these children’s future needs such as education and human development. For how are the children, what needs do they have and what impact will they have on our society in general? The book contains illustrations of the crystal aura, the indigo aura and the old time aura.